Cradled between the world's highest mountain ranges on the edge of the Tibetan Plateau, Ladakh means ‘land of many passes’. Located in a hidden corner of northern India, Ladakh is one of the least populated areas of the Himalaya. Landing in Leh, the capital of Ladakh, is like stepping back to a time when lives were lived according to the seasons and the scriptures, and the outside world is far away. Visit picturesque white-washed monasteries perched atop rocky hills and mountains, where Buddhist philosophy is taught and debated. Trek amid breathtaking landscapes and experience the rich culture of Ladakh. Experience the warm hospitality of the local Ladakhi people. Time your visit to coincide with a festival, when Ladakh comes alive and people from all over the area converge to celebrate their rich cultural heritage. Visit the picture-perfect Thiksey Monastery and the spectacular Chemrey Monastery, sitting high above fields of barley. Whichever direction you go in Ladakh, jagged mountain peaks and wide glacial valleys lie on the horizon. 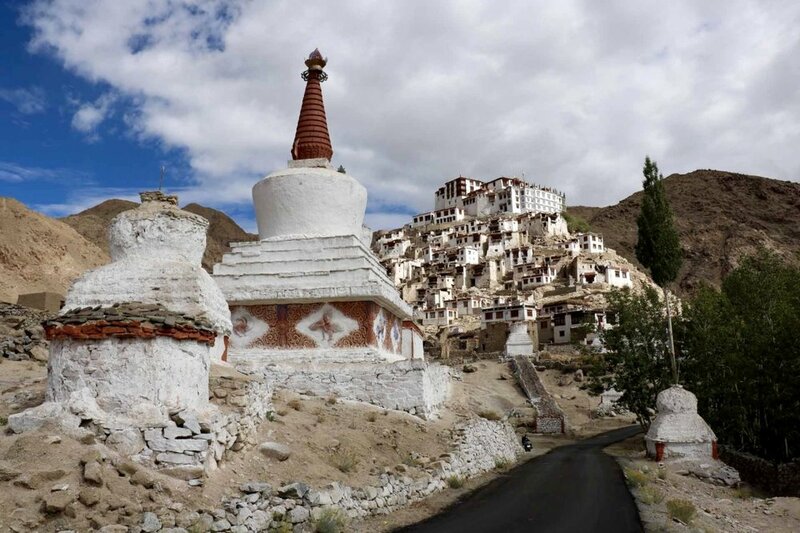 The team at Beyond The Clouds have found some real gems for you to stay in, on the banks of the Indus River, in off-the-beaten-track villages and in the historic heart of Leh. From simple Ladakhi homestays to boutique hotels, we keep your comfort in mind while offering an authentic experience. Combine the highlights of Ladakh with a trek, practice yoga, join a Ladakhi cooking lesson or let us tailor-make a personalised itinerary to suit your needs. Whether you’re travelling solo, as a couple, or in a group; whether you are interested in walking, trekking, festivals or culture, the Beyond The Clouds team will be delighted to put together the perfect itinerary just for you. Explore the highlights of this historic region - the ancient monasteries, the colourful festivals, the rich traditions, and the otherworldly landscapes. From a short trek staying in local homestay villages, to a longer multi-day high-altitude exploration, there is something for every level of adventure in Ladakh. Let our guides show you the best trekking routes in Ladakh. Journey in the footsteps of pilgrims who have been visiting Ladakh for hundreds of years to pay their respect and mark their devotion to Tibetan Buddhism. Ladakh is perfect for pilgrimage - monastic culture thrives, dharma is part of daily life, and the landscapes are both awe-inspiring and peaceful. Peaceful, remote, spiritual - what better place to practice yoga than this hidden corner of the Himalaya, where Tibetan Buddhism is deeply rooted in the very culture? Strike a pose amid towering peaks, next to bright prayer flags, or under the perfect crystal-clear starry sky. This is a yoga journey you won't forget. Experience Ladakh your way, on your schedule. Let us help you design the perfect itinerary to visit all the sights you really want to see, and none of the ones you don't! Private, personalised journeys are the best way to truly explore Ladakh and meet the local people. Whether you're after monasteries, mountains, homestays, retreats, luxurious lodgings, or authentic experiences, we'll take you there. We cater to solo travelers, whether it’s your first solo travel experience or you do it all the time! With experienced, English-speaking guides that we hand-pick, solo women or men can feel comfortable sightseeing or trekking alone with their guide in Ladakh.